A commission tasked with overseeing Richmond International Airport’s growth and development is preparing to dole out a contract for an eight-figure expansion. 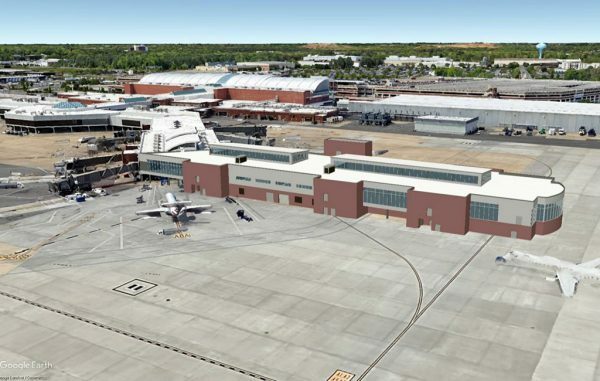 The Capital Regional Airport Commission is slated to solicit bids from general contractors for a $45 million Concourse A expansion in June or July, airport spokesman Troy Bell said. The earliest the commission could vote on a contractor proposal for the project would be at its July meeting, Bell said. Mechanical plans for the expansion were submitted to Henrico County’s Planning Department in late February, signaling the commission’s desire to launch its request for proposal in coming months. Plans call for the addition of six gates to the eight-gate Concourse A – currently the smaller of the airport’s two concourses – to mirror the 14-gate Concourse B. There also will be room for additional retail and concession spaces in the newly expanded concourse as demand warrants. The expansion project is estimated to take 18 months to complete, Bell said, with the new space estimated for delivery by spring 2020. 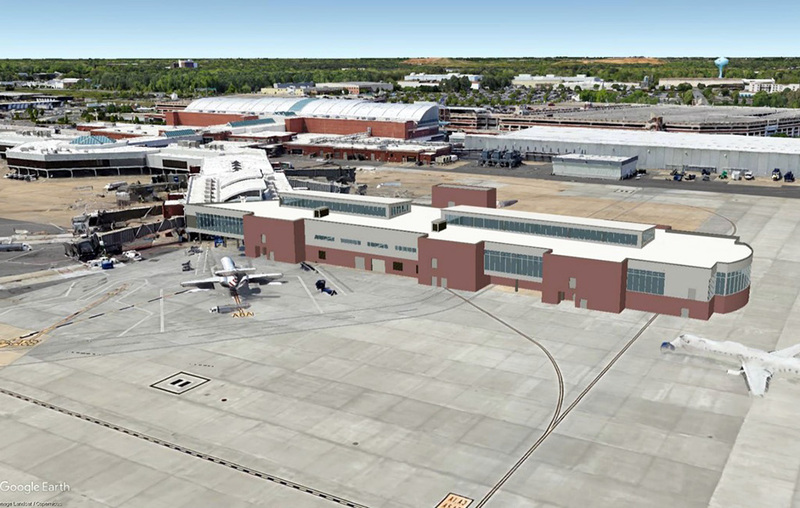 Concourse A’s expansion is consistent with the airport’s master plan, which the commission approved more than a decade ago as a blueprint to RIC’s growth through 2026, and how best to maximize space at the 3,000-acre facility in eastern Henrico County. An earlier phase of the expansion was carried out a few years ago with a 14-acre extension of Concourse A’s ramp, Bell said. The new concourse will fill out the terminal space to match that of the extended ramp. Bell said the expansion also would help balance the passenger ratios on both sides of RIC. Passenger traffic was nearly 3.7 million in 2017, according an RIC aviation report. That’s up from about 3.5 million passengers in 2016 and marked a record-setting year, surpassing its pre-recession peak from 2007. American Airlines, JetBlue and Allegiant operate from Concourse A, Bell said, adding that those carriers will remain in the concourse upon its expansion. While the airport is seeing a steady increase of passengers and new flights, Bell said, the need to accommodate additional aircraft parking is driving demand for more gates in Concourse A. “RIC tends to see a high and growing demand for overnight parking positions,” he said, referring to planes that park in Richmond so crews can rest in hotels nearby. That flexibility appears to be paying off. Earlier this year, Allegiant announced nonstop service to Nashville from RIC, and Spirit Airlines recently began flying out of Richmond to Orlando and Fort Lauderdale. RIC’s centralized location has proven to be an asset for both travelers and airliners – with the airport welcoming passengers from as far north as Charlottesville to as far south as Rocky Mount, North Carolina. The terminals also can accommodate a mix of regional jets and wide-body planes. With more people flying from Richmond, Bell said additional plans are in the works for a $4 million Concourse B security checkpoint expansion, and $35 million North Garage expansion. RIC also is considering an expansion of its rental car garage. Bell said the projects, including Concourse A’s future upgrade, are necessary to keep RIC competitive and support the area’s growth. “The Concourse A expansion is consistent with the airport commission’s philosophy to be slightly ahead of the curve for facility development,” he said. 1 Comment on "RIC to accept bids for $45M expansion this summer"
I’m super excited about the airport’s expansion plans! Hopefully, this will usher in more flights and more airlines (I’m looking at you Frontier, Alaska…heck, even you Norwegian!). I’m also glad RichmondBizSense is doing articles on airport developments! Continue to keep us informed on the latest going on at RIC!